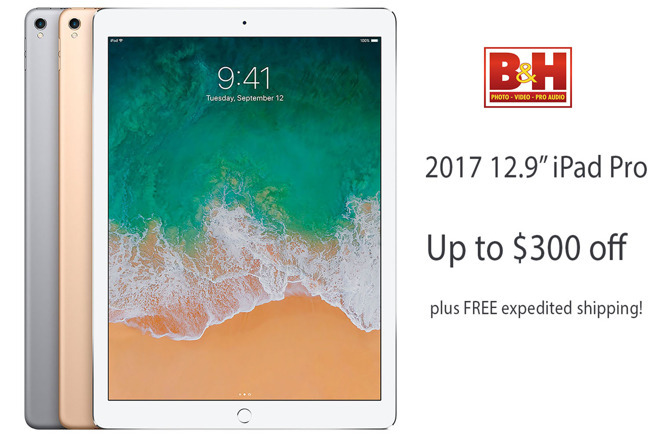 DEALS EXPIRED: Apple authorized reseller B&H is slashing prices on Apple's 2017 12.9-inch iPad Pro with discounts of up to $300 off. These tablets also qualify for free expedited shipping within the contiguous U.S., with no tax collected in many states. These deals, which are limited to stock on hand, may sell out at any time. To see how the markdowns stack up, be sure to visit our 2017 12.9-inch iPad Pro Price Guide.